I love Quentin Tarantino movies. There's just something about the way he writes dialogue and puts scenes together that hits all the right notes. 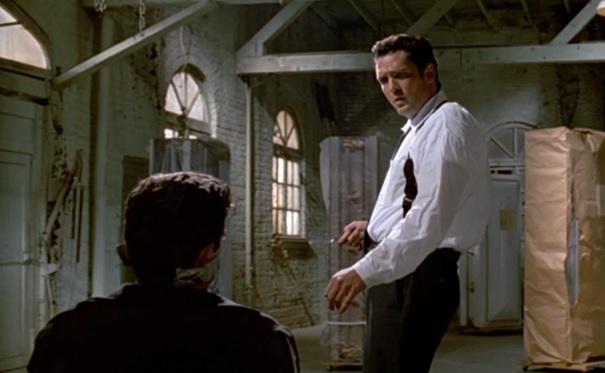 The infamous scene in Reservoir Dogs where Mr. Blonde (Michael Madsen) dances to the Stealers Wheel hit "Stuck in the Middle With You" while taunting and torturing a police officer is disturbing, yet it fits the tone of the movie perfectly. The fact that the D.J. on the radio (K-Billy's Super Sounds of the 70s) happens to be my favourite comedian of all time (Steven Wright) is an added bonus. Yet for some, the violence in Tarantino's debut proved too gruesome, too vulgar, and perhaps too realistic. I guess you can't please everyone. 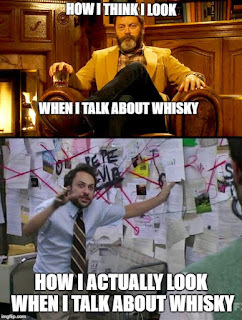 This applies to whisky as well. You can't be all things to everyone. The second installment in my John Cusack-inspired "Top 5" series is stuck in the middle. These whiskies won't be all things to all people, but they are more potent than the mild quintet from the previous installment. If you're hankering for something with a bit more "oomph", these whiskies may be for you. They aren't "peat bombs" or "sherry bombs" by any means, but they are more Mr Blonde than Mr Pink. And I'd much rather be stuck with a bottle of these 5 whiskies than tied to a chair with Mr Blonde singing to me. I'm going to risk drawing the ire of whisky snobs right away. Yes, I'm recommending a "common" scotch. How mainstream ! How pedestrian ! Well, let me tell you something, you hipster-doofuses (hipster-doofi? ); this is, in my humble opinion, one of the best values in scotch whisky today. It currently runs about $80 here in Ontario and it outperforms many pricier malts. Using a Solera system common in the maturation of sherry, 15 year old malts from three different types of casks are married together in a wooden vat, which is constantly topped up to ensure the quality is maintained. 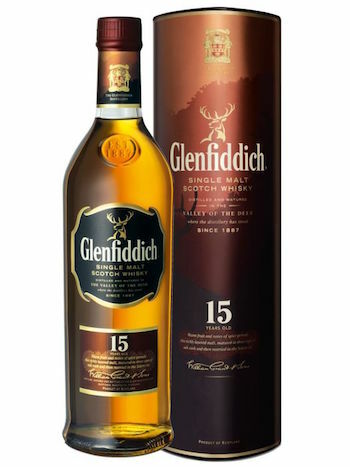 Glenfiddich 15 is rich (but not too rich) with cinnamon, ginger, sherry notes, oak and almonds. As an added incentive, when you buy Glenfiddich 15 here in Ontario, two dollars from the sale of each bottle of is donated to Wounded Warriors, a program that helps soldiers in need. Great whisky and a great cause. You should buy a bottle of this for yourself, and maybe get a bottle for your favourite whisky blogger. I almost put Yellow Spot's little brother, Green Spot, on my "born to be mild" list. 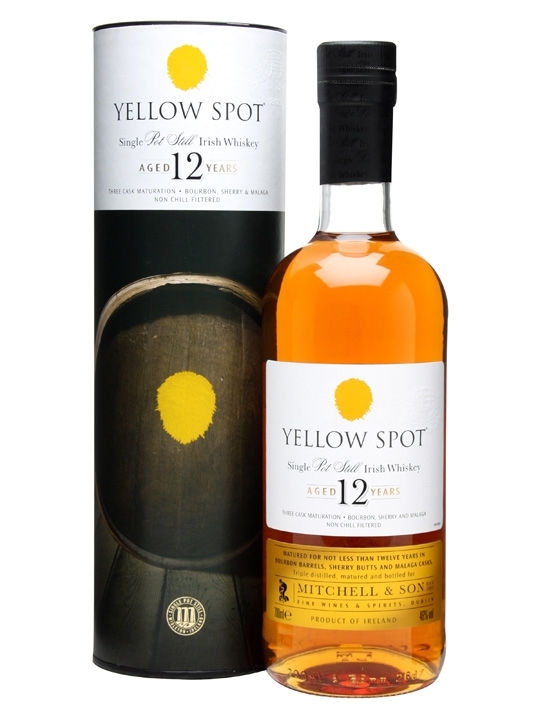 Yellow Spot carries a 12 year old age guarantee and can compete with many wine-casked single malt scotches. Eat your heart out, Glenmorangie Lasanta ! 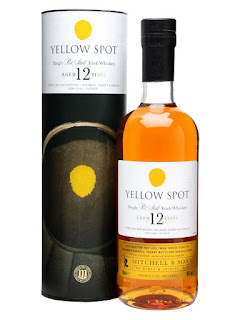 The Yellow Spot is a single pot still Irish whiskey which has been matured in three types of cask: American Bourbon cask, Spanish Sherry butts and Spanish Malaga casks for a sweeter flavour. This one is rich with butterscotch, peaches, grapes, lemon, almonds, and some barley. Rich, but not overly bold, even if it is bottled at 46% ABV. Highly recommended. Knob Creek is made/owned by Jim Beam. This bourbon is supposedly named for a creek near the childhood home of Abraham Lincoln. Rumour has it that Honest Abe was almost drownded in the creek as a child. (Yes I wrote "drownded" on purpose. Read "The Lord of the Rings" would ya!?) I guess Scotch whisky hasn't cornered the market on clever origin stories. Regardless of the veracity of the story, this is a fine bourbon. It isn't as mild as a wheated bourbon, but it is still considered a "lower rye" bourbon. 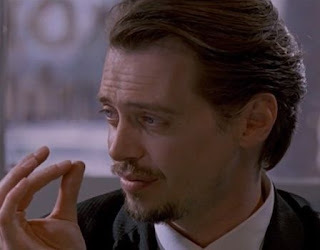 I don't know what percentage of the mash bill is rye, as that information is not readily available. Nevertheless, this is a tasty bourbon at a reasonable price. 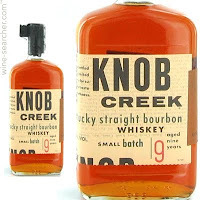 Knob Creek 9 Year Old is nutty, oaky with a bit of spice on the finish. It's fairly friendly for a bourbon at 50% ABV, and that could get you in as much trouble as swimming in a creek. Rumour has it that the age statement is going to disappear from this bottle soon. That's a sad state of affairs; I guess Knob Creek is not as patient as it once was. It's hard to say anything negative about The Balvenie. Their offerings are among the most consistently good in Scotch whisky. At least, that's been my experience. 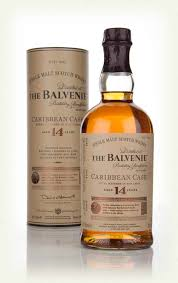 Their 14 Year Old Caribbean Cask is no exception. It's rich, sweet and slightly fruity from a final maturation in ex-rum casks. Vanilla is the dominant note, with some nutmeg, raisins and honey rounding out this lovely single malt. If you're a pirate captain who has been viciously mutinied upon and marooned on a desert island, this beauty might be a nice discovery while you wait to be rescued, or while you wait to rope yourself a couple of sea turtles. Just make sure not to leave this Caribbean Cask unattended or you may find yourself asking why the rum (or scotch, as it were) is always gone. 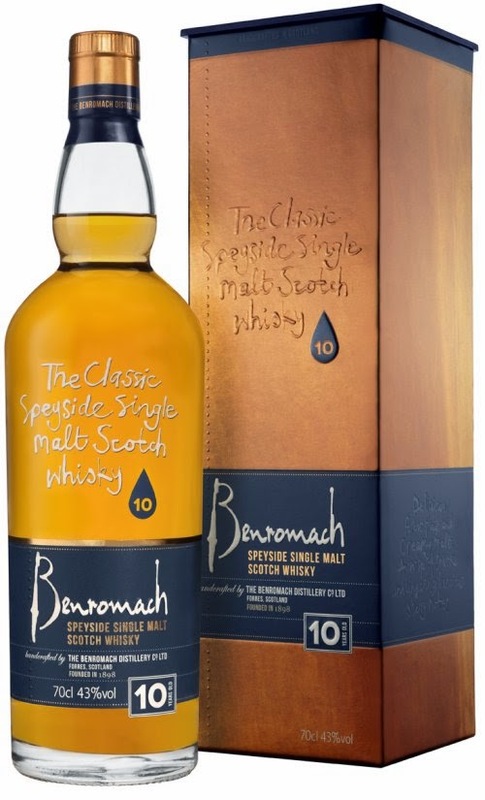 I reviewed Benromach 10 here. Looking back at my review, I was surprised at my ranking. Three and a half moustaches is a fine rating, but as of this writing, my bottle of Benromach 10 is about 7 months old and is even better now after being exposed to air. There is more peat character than there was at the time of the review. If you're just dipping your toe in the peated whisky pool, fear not: this is NOT Laphroaig-esque campfire in a glass. The peat note is much softer and more subtle than the Islay whiskies I love. Benromach 10 is currently out of stock (or very difficult to find) at the LCBO and it's no surprise. It's still listed (as of September 2017) at $59 per bottle. That's a ridiculous steal of a deal for a whisky this good, by Ontario pricing standards. There's lots of vanilla, raspberries, charred oak, peat smoke and some shortbread biscuit notes in there. If and when the price goes up, I will still buy this malt. It's the type of whisky I always want to have on hand. But unlike Highland Park 18 or Laphroaig 15, I can actually afford to keep Benromach 10 around for casual sipping. I can't possibly praise it enough. So there you have it, my friends. Whiskies I consider "Top 5" for middle of the road. They won't blow your face off, but they're all terrific. Some of my other favourites didn't make the cut because I wanted a bit of variety in my picks (sorry Craigellachie 13). Each whisky here has a different character, a different strength that they bring to the table, like the colourful characters in Reservoir Dogs. No matter which one you pick, you can't go wrong. Unless you start telling people you don't believe in tipping. Interesting list - I'm curious, though, what makes these more 'challenging' than the previous list. Benromach 10 wouldn't be something I would be afraid to give a newby, for example. Thanks for the comment. I would absolutely not give Benromach 10 to a newbie. Here's why: peat and complexity. As whisky enthusiasts, we tend to forget that those new to the spirit are far more sensitive to things like higher alcohol content, peat, spice and complexity. These whiskies are a bit more complex, rich, and in the case of Benromach 10, more peated than the mild list. Ben 10 is also more complex than the low price and 10 Year Old age statement leads people to believe. At least, that's how I see (taste) things.